Wait before you brush. . .
Brushing your teeth straight after eating is not the best idea. Oral bacteria attack the remnants of food on and around the teeth causing acids to accumulate in the saliva. A process known as demineralisation occurs which, for a short time makes tooth enamel more porous. 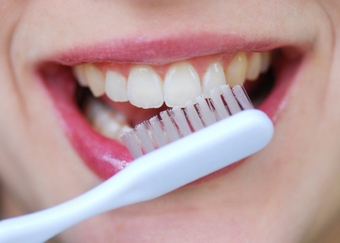 At this time, the enamel is more vulnerable to strong brushing. The good news is that remineralisation follows, restoring the enamel to its full protective strength. The recommendation is to rinse your mouth with water after eating and wait about an hour before you brush your teeth. Eating lollies slowly through out the day means remineralisation may be incomplete before the next ’round’ of acid comes from bacteria feeding on the remains of another sweet. This habit will almost certainly result in dental caries or decay.